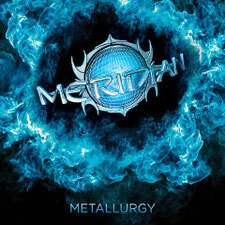 Danish melodic metal band MERIDIAN will release their long-awaited debut album "Metallurgy" through Mighty Music and Target Records on December 9th 2013. MERIDIAN was found by Klaus Agerbo (drums) and Peter Bruun (bass) in the port town Esbjerg (Denmark) in 2005, Lars Märker (vocals) jumped aboard the following year and Steffan Pedersen (guitar) joined the band in 2009. The band plays good old-fashioned heavy metal in loud, fast, heavy and energetic, always focusing on the melody - both in harmonic guitar themes and in the clean and bright vocals. Their two previous EPs "All the World's a Cage" (2007) and "Inside the Machine" (2009), both received a series of positive reviews in the Danish press. Although the first recording of "Metallurgy" was finished in April 2011, they were not satisfied it. They tried to the record again, and they succeeded to make a sound match the quality of the material on the second record. The album was produced by the acclaimed producer Christian Bonde at CB studios (Dawn Of Demise, The Cleansing, Siamese Fighting Fish) and mastered by Jacob Hansen (Mercenary, Hatesphere, Volbeat, etc). They say MERIDIAN is emerged as a product of the contemporary national success story in Esbjerg in recent years. Hope they will succeed to rise not only in European metal scene but also worldwide.